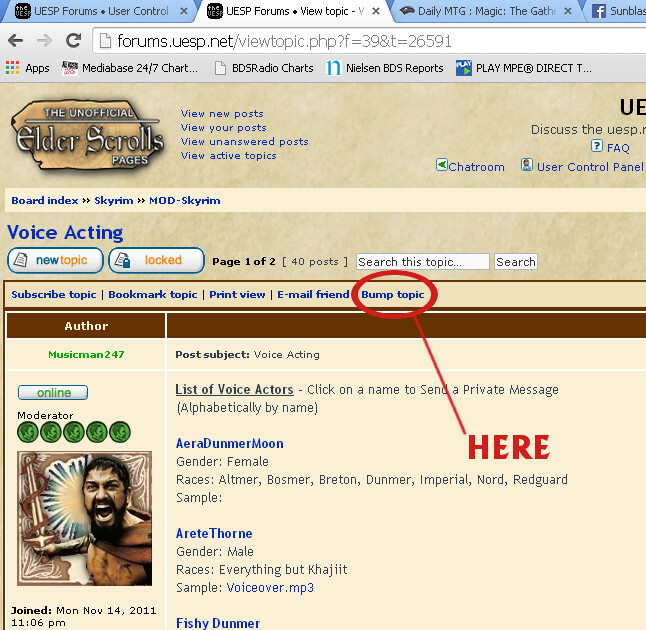 UESP Forums • View topic - HOW TO BUMP YOUR THREADS! Post subject: HOW TO BUMP YOUR THREADS! We have had a rash of people posting spam in this sub-forum in the form of posts that only exist to bring attention to their topics, and so we have removed the ability to reply to topics. That out of the way, there is good news: the forum has a built-in Bump feature! The author of the thread can bump their topic so it will once again be on the top of the list of threads. The link appears at the top of the thread, just above the first post. I've included a picture for reference. If you really need your post back on the top of the list of threads but don't have any new information to add, please use the Bump Topic link.